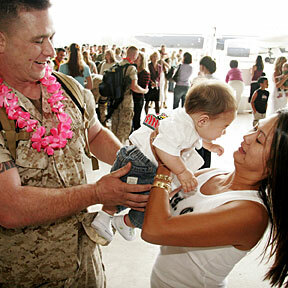 KANEOHE MARINES COME HOME: More than 200 Kaneohe Marines returned home yesterday after a seven-month deployment to Afghanistan. Among them was Sgt. Gary Carr, who gave his son, Zachary, back to his wife, Paula, after he saw and hugged him for the first time. The cost of crude oil drives an expected increase in the state's prices at the pump. Emotions erupt as Shaun Rodrigues is taken to prison. After a long delay, Mercedes champion Stuart Appleby gets ready to tackle the Sony Open. Two national business figures will join the company's board. Appellate Judge Samuel A. Alito has begun conformation hearings before the Senate Judiciary Committee.